This is one of the earlier vehicles used by the LRDG in 1940/41. Of the seven acquired three were used as scout cars by patrol commanders and the remainder four by HQ staff. They were replaced by Chevrolet WB 30cwt trucks during the course of 1941 (not the famous Chevrolet 1533, these came only in March 1942). The cars were cut down 1940 Ford US commercial pickups, based on the same 112in chassis used for passenger cars, armed with one or more Vickers or Lewis guns. The example shown in the Osprey Vanguard LRDG book only carries a Vickers mounted in the pickup bed. The Wespe model is beautifully cast in resin with a gazilion small parts. My model has only 4 wheels instead of the six shown on the instruction sheet. The instruction sheet is a tiny photocopy (about 10 by 15cm). The pictures here are clearer than the original. The wheels are runflat tires, with the tread pattern extending onto the sides. They had very thick sidewalls, so they would not collapse even if punctured. The kit comes with 3 Lewis guns. A mix of guns would have been better. Moreover the few pictures of this car always show a Vickers watercooled MG.
- The model is right hand drive whereas the original is a US-built left hand drive vehicle. - The grille is that of a 1940 Ford deluxe. It should be that of a 1939 Ford Deluxe, which was carried over for 1940 Ford standard and commercial models. 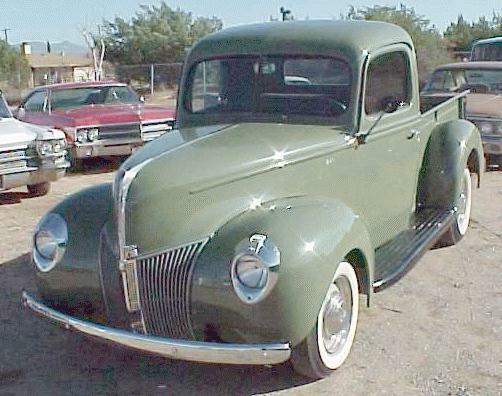 Click here for a page full of 1940 Fords. This is the 1940 Ford pickup model similar to those originallly acquired by the LRDG. These flaws automatically knock the kit into the conversion category. Changing the RHD to LHD is not too difficult but resculpting the grille is a major undertaking. This is nevertheless a fine kit of a very rare subject. Wespe has since moved on to 1/72 scale vehicles so their 1/76 line will not grow. Panzer models of Brazil make a superb 1/35 model of this vehicle. Please check the preview of the SMA Ford 01 tropical, which depicts essentially the same vehicle.